You may have heard the term climate variability. What does the term climate variability mean? 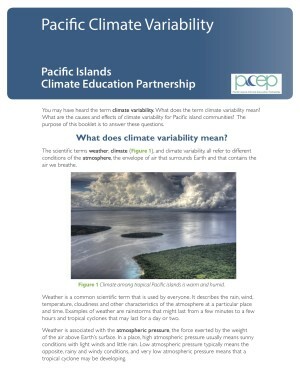 What are the causes and effects of climate variability for Pacific island communities? This booklet by Dr. Charles “Chip” Fletcher can help teachers and students understand how natural processes cause our climate to vary from year to year, and what that variability means for our region. Information on specific USAPI locations is available through other booklets in the Climate Change in the USAPI series.